June 10, 2011 – The U.S. Fish and Wildlife Service informed the City of Golden on June 9, 2011 that it will conduct an environmental assessment of competing proposals from Golden and the Jefferson Parkway Public Highway Authority (JPPHA) to purchase a transportation right of way from the Rocky Flats National Wildlife Refuge. Golden expects the environmental assessment, which will compare the environment impacts of the two proposals, to take several months. The Fish and Wildlife Service, an agency of the U.S. Department of Interior, controls the Rocky Flats property. Golden offered $3 million for a 2.76-mile stretch of right way along Indiana Street that is currently part of the Rocky Flats refuge. The City’s offer, which is $200,000 more than the JPPHA proposed for the same property, will allow Golden to create what it will call the Jefferson Bikeway, providing bicycle and pedestrian trails that will connect with other regional trails. The law creating the Rocky Flats National Wildlife Refuge contemplated that any local government could apply for the use of an up to a 300-foot right of way for transportation uses, so long as the use minimized effects on the refuge. Golden believes its bike and pedestrian trail would be much less impactful than a toll road, providing residents throughout the region better transportation options without disrupting the spectacular views of the mountain backdrop and unique grasslands throughout the area. It would also minimize effects on threatened species and rare habitat who call the area home, and it would minimize sprawl. Preserving natural resources was the main reason for the refuge’s creation. Golden’s plan also will allow for much-needed roadway improvements on the Indiana Street corridor. The Fish and Wildlife Service’s environmental review process will likely provide opportunities for public comment. 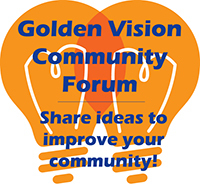 Golden will also alert citizens and the city’s neighbors at key junctures in the process when they will be able make their voices heard. “The JPPHA has pushed its toll road plan with the attitude that it is inevitable and communities like Golden that have legitimate concerns should just roll over or get out of the way. We appreciate that the Fish and Wildlife Service is taking a thoughtful and measured approach to this issue that considers the importance of our region’s precious natural resources,” Bestor added.